Days after playing the Bonnaroo festival in The Mars Volta alongside his brother Omar Rodriguez-Lopez, multi-instrumentalist Marcel Rodriguez-Lopez will hit the road once again. This time he joins another of his siblings, bassist Marfred Rodriguez-Lopez in their prog-rock groove outfit Zechs Marquise. While sharing The Mars Volta's penchant for expansive passages, Zechs Marquise takes a hazier, psych-laden approach to its songs, as evident on its 15-track debut album Our Delicate Stranded Nightmare to be released Fall 2009 via Rodriguez Lopez Productions (listen to: "Chase Scene" and "Sirenum Scopuli") The El Paso, TX based quartet brings its heaving sounds to the east coast in July, opening for Sargent House band RX Bandits. See complete dates below. 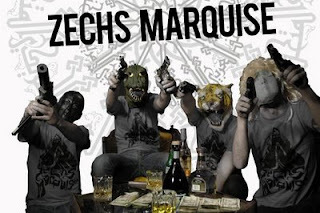 Zechs Marquise formed in El Paso, Texas during the spring of 2003 when brothers Marfred and Marcel Rodriguez-Lopez came together with childhood friends Matthew Wilkson and Marcos Smith. The group soon named itself after a popular Japanese anime character and hit the studio to record its first album during the late summer months of 2004. That studio effort was later scrapped and in June 2006 the band instead released 34:26, a live improved set that showed its great range of talents and influences. By fall of 2006, Zechs was touring the west coast consistently, sharing the stage with such eclectic acts as Daedelus, Busdriver, The Album Leaf, (DJ) Nobody, Daddy Kev, The Gaslamp Killer, and Totimoshi. July 2007 saw the band return to the recording studio. Having learned from the difficulties of their first attempt, the quintet decided to keep all of the recording in house, purchasing a mixing board, microphones, and Pro Tools in order to track all of the recordings themselves. After a few days in their studios, dubbed Castle Greyskull and El Morro, the members realized they had enough material for a full length album. The record, Our Delicate Stranded Nightmare, was completed in February 2008. Zechs Marquise then spent time on the road, auspiciously touring with Free Moral Agents & Blank Blue. In March 2009, the band made its first adventure overseas to Europe, opening for the Omar Rodriguez-Lopez Group, in which Marcel -- then performing double duty -- is also a player. During the overseas tour, Our Delicate Stranded Nightmare was released in Europe by RLP/Willie Anderson Recordings on CD as well as the first pressing of the album on vinyl. In May 2009, Zechs Marquise signed on to the prestigious management roster at Sargent House and will release Our Delicate Stranded Nightmare in the U.S. on vinyl and CD on August 25th through Rodriguez Lopez Productions.